RJE Business Interiors: InMovement products get the office in motion. InMovement products get the office in motion. Sitting Disease is a real thing. While “sitting disease” sounds like something that only Homer Simpson might suffer from, medical studies have shown that it’s very real and can be caused by a prolonged period of time spent sitting in an office chair. Research has shown that the long hours we spend sitting at our office desk has been connected to a wide range of health problems, from heart disease and diabetes to physical pain and even depression. The compounding effects of working in a sedentary environment cannot be undone through short bursts of daily exercise, and ultimately end up costing businesses an increasing amount money in healthcare expenses and productivity loss. To combat this unhealthy trend, RJE has introduced a new series of office furniture designed to get employees to move more during the work week. 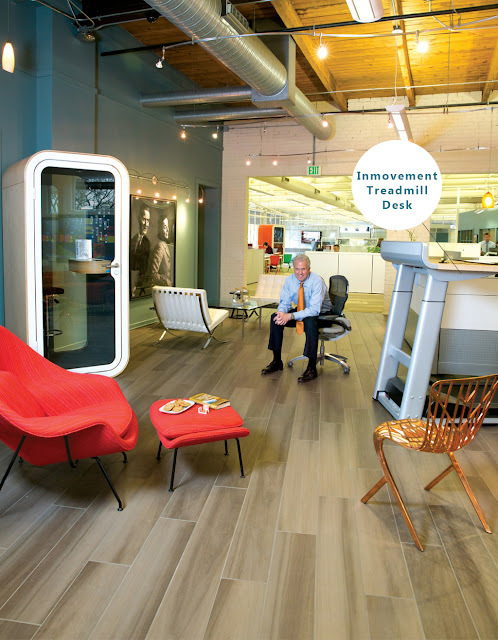 Called InMovement, it is a line of office furniture featuring equipment that easily integrates healthy behavior into daily work. InMovement’s office furniture provides employees the opportunity for improved physical health, fewer aches and pains and increased energy all while allowing them to focus on the task at hand. Try it in our Indianapolis showroom. When you walk into the showroom of RJE in downtown Indianapolis, one of the first things you’ll see is the InMovement TreadMill desk. It has an impressive deck with more than enough desk space to accommodate not only your laptop, but a full suite of the essentials for accomplishing your everyday tasks. It’s easily personalized to fit any height at the push of a button and it features a convenient connectivity panel that makes it easy to power your devices via USB docks plus Ethernet connectivity. The LCD Intel display will keep track of your results, showing your walking duration, steps taken and miles walked, providing visual confirmation of the benefits of burning calories versus a sedentary day behind a desk. Using the InMovement TreadMill desk allows you to prioritize your health without sacrificing your work. Walking not only keeps you from being trapped in a chair all day, but it helps keep the brain active and has been linked to increased energy, productivity and overall improved mood. If you’d like to see the InMovement Treadmill desk in action, we invite you to take a peek inside our creative, ever changing, working showroom. We’d love to hear from you. Contact us, today!